Credit: Katja Kornysheva & authors. Neuroscientists at Bangor University, (Wales,UK) and University College London (UCL) have for the first time, identified the processes which occur in our brains milliseconds before we undertake a series of movements, crucial for speech, handwriting, sports or playing a musical instrument. They have done so by measuring tiny magnetic fields outside the participants’ head and identifying unique patterns making up each sequence before it is executed. They identified differences between neural patterns which lead to a more skilled as opposed to a more error-prone execution. The research, funded by the Wellcome Trust, is published in Neuron Issue date 7 FEBRUARY 2019 (doi: 10.1016/j.neuron.2019.01.018). Following further research, this new information could lead to the development of interventions which would assist with rehabilitation post-stroke or improve life for people living with stutter, dyspraxia or other similar conditions. “Reviewing the brain impulses, we could see that when participants were producing the sequences correctly and accurately, with no errors, each activity was spaced and ordered in advance of being executed. However, when mistakes occurred, the ‘queuing’ of actions was visibly less well-defined as separate and distinct actions. 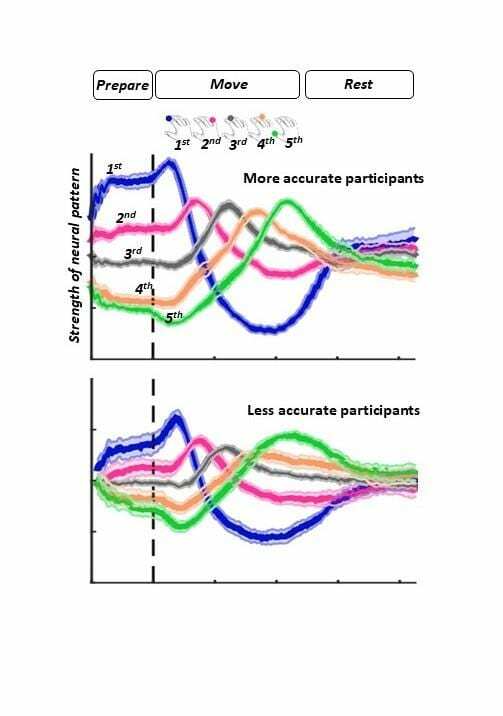 It appears that the more closely bunched and less-defined ‘queuing’ was, the more participants committed errors in sequence production and timing.